Bar soaps were once thought of as a little old fashioned, but with more people paying attention to packaging waste and looking for gentle options on the skin soap is very much making a comeback. I have tested quite a lot of soap over the years and I firmly believe making a good bar of soap is very much an art form, it can be a little too stripping on the skin, or the formula can get soggy quickly meaning that the bar doesn’t last. Needless to say when I find a formula that is nourishing, luxurious and lasts well I know it’s a keeper. Trevarno is a brand that has been around for some time, based in Cornwall the brand was originally created on the Trevarno estate which has since closed to the public. 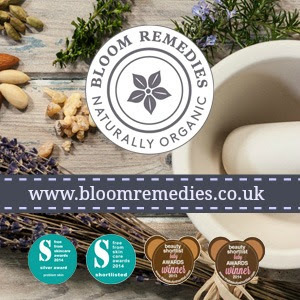 I have been impressed with so many of the products I have tried over the years, the products are honest but have a touch of luxury thanks to the quality ingredients and simple but elegant packaging. The products are certified organic by the Organic Farmers and growers certification and have a minimum of 95% organic ingredients. The Rose and Jojoba Soap (£4 for 75 grams) is a great example of how natural and organic products can be great value for money. 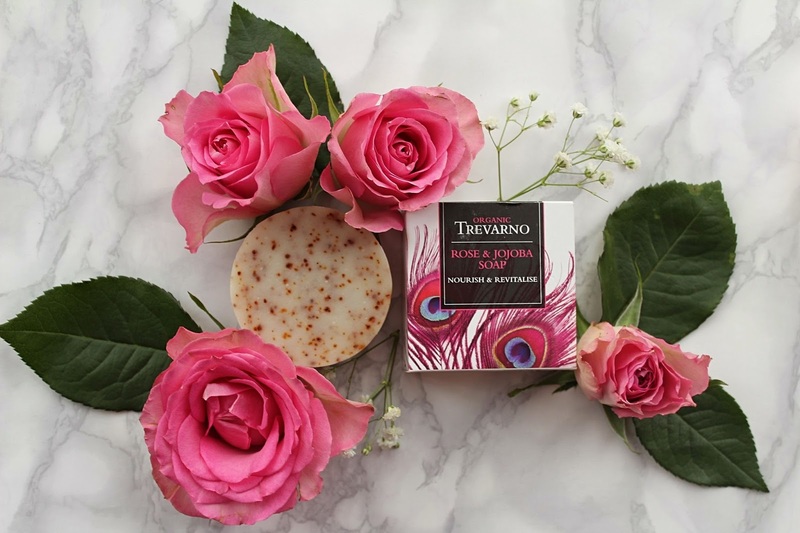 These solid soaps come in a lovely variety of formulations, the Rose and jojoba uses jojoba oil that has been infused with rose petals which sounds utterly luxurious. It has a very light fresh scent from Palmarosa and geranium essential oils and although I love a really strong rose scent, I thought it was lovely that this was a little lighter for those that don’t. The soap creates a beautiful soft lather that feels really indulgent. It is packed full of moisturising ingredients such as coconut oil, olive oil, shea and cocoa butters. Even the driest of skins will find this a pleasure to use, as it leaves the skin soft, supple and balanced. It is palm oil free, which is always a bonus, although I don’t avoid palm oil completely (it would make blogging very difficult indeed) I know many people prefer their products to be free of it completely due to the environmental impact. The packaging of the soap is simply gorgeous and the price point and luxe feel makes it a great little gift for anyone who loves natural ingredients and ethically made products. 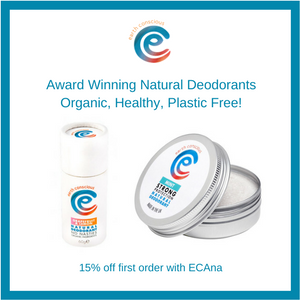 A really fantastic product that ticks so many boxes in terms of ethics, packaging and performance and an easy way to incorporate an organic product in to your routine this organic September. 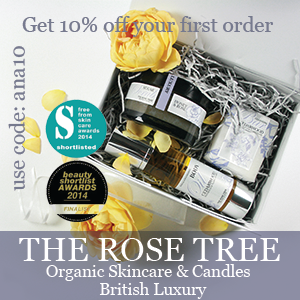 You can find the Trevarno range at Only Naturals*. Post contains PR samples and affiliate links (Affiliate links are marked with a *) please see my full disclaimer for details.